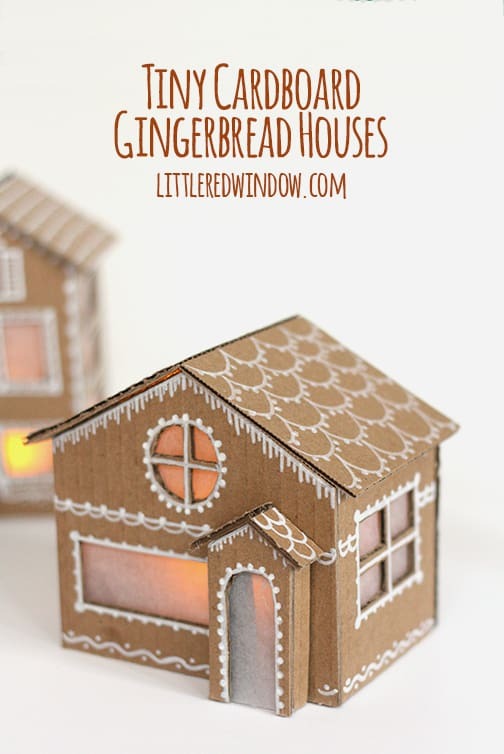 These Tiny Cardboard Gingerbread Houses light up and are a fun and easy DIY project this holiday season! 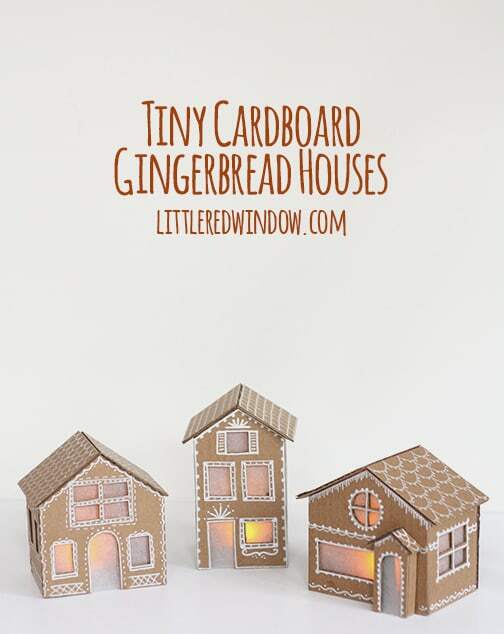 As I was making these adorable little cardboard gingerbread houses, I was thinking that I don’t know if I’ve ever really talked about what I used to do for a job before this. I worked for an architecture firm doing 3D computer rendering and animation. So if you were investing in the construction of a building, we would show you really cool realistic computer generated images and walk-through animations showing you what the building would look like inside and out. I created complete 3D computer worlds with the buildings and materials and roads and trees and people and everything. It was definitely challenging and interesting and occasionally creative and I did like it. But what I liked best was that I had to mostly teach myself how to do it so I was constantly learning things and solving puzzles. And the funny thing is, even though architecture has become almost completely computerized in the real world, when you’re in school, you do most of your work by hand. When I got my Masters, I spent 3 years doing hand drawings and building models with nothing but glue and and an exacto knife. 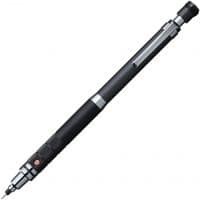 I’m sure there is some rationale behind this kind of hands on design but really, don’t get me started on the lack of real world technological preparation I got in school. I sometimes like to joke that I don’t have a Masters of Architecture, I have a Masters of Cutting and Gluing. Little did I know that would actually turn out to be valuable later on! 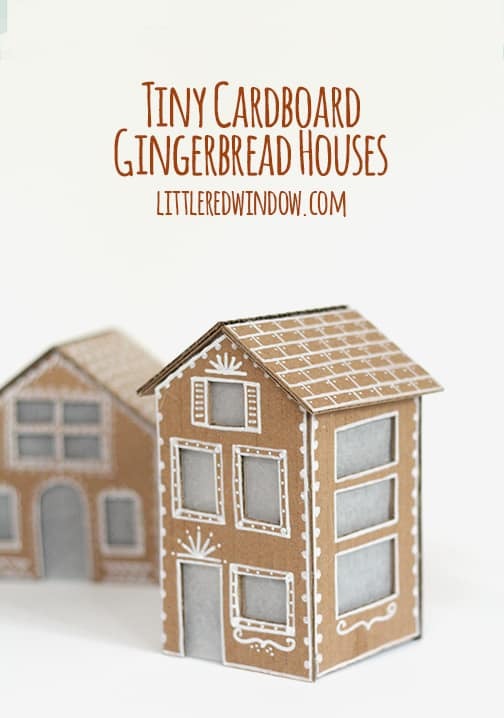 Anyway, back to the point, I made these tiny, cute, little cardboard Gingerbread Houses our of recycled cardboard boxes. I’ll show you how I did it and it only took me a couple hours, but if you do not have a Masters of Cutting and Gluing, you might expect them to take a little longer. It’s worth it, in my opinion, because they are just so darn adorable! 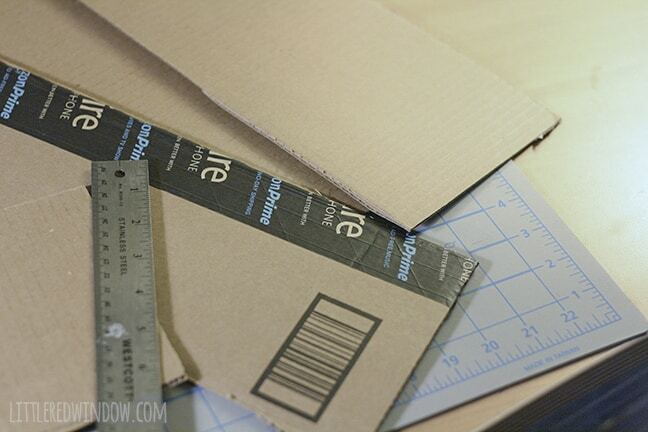 Cardboard – use an old box! 1. 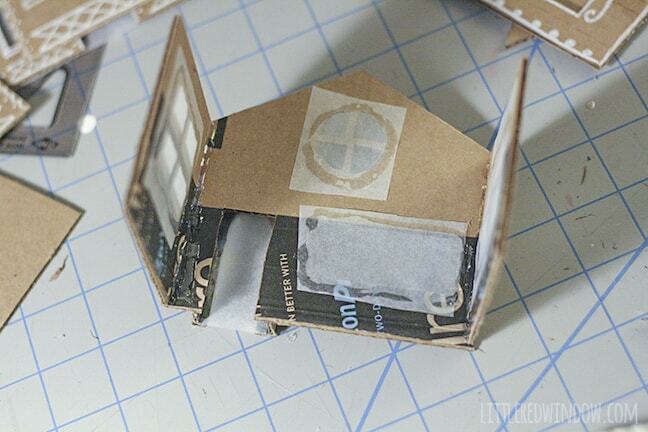 Gather some cardboard and ruler and start drawing out your houses. I drew all the pieces before I cut anything. For reference, my houses were 4 inches by 3 inches. The tall one is 3 inches by 3 inches. I drew everything but the roof pieces. 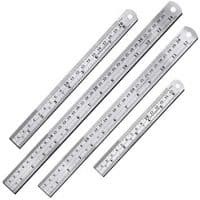 I won’t give you more exact measurements because the fun is really in designing your own! go slow, it will take a few passes to cut all the way through. 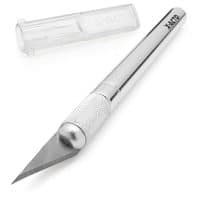 If your edges start to look ragged or it get harder to cut, change to a new blade. I changed my blade twice during this project. sometimes it helps to turn the piece of cardboard over to see where you haven’t cut through yet. This can be helpful at corners. 3. 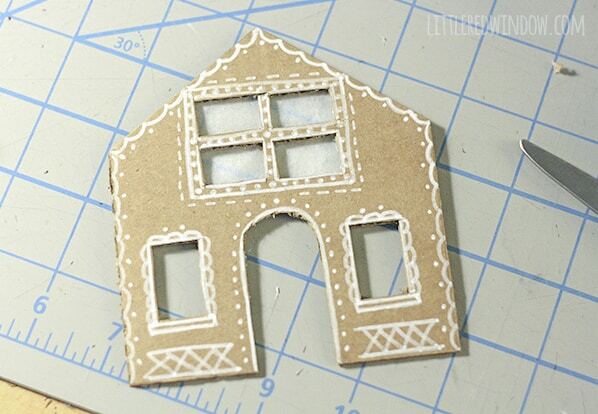 When all of the sides are cut out of your houses, use your white paint pen to decorate them like gingerbread houses. 4. 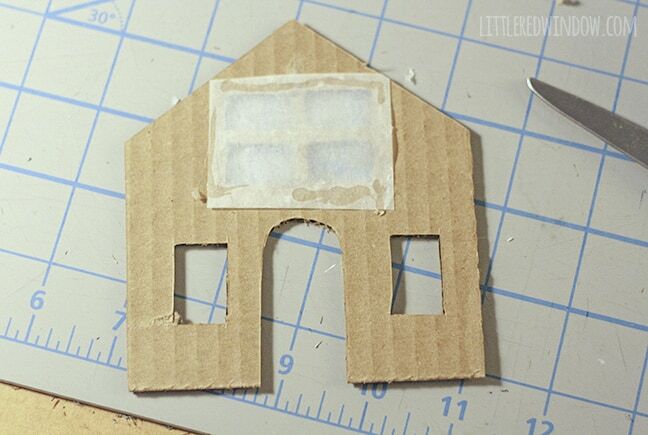 Turn the cardboard pieces over and glue small pieces of tracing paper over the back of the windows and doors. 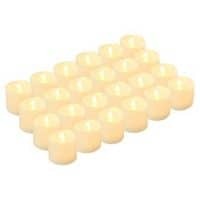 This will make the houses glow and stop you from seeing the battery operated candle inside. 5. Start constructing your houses. 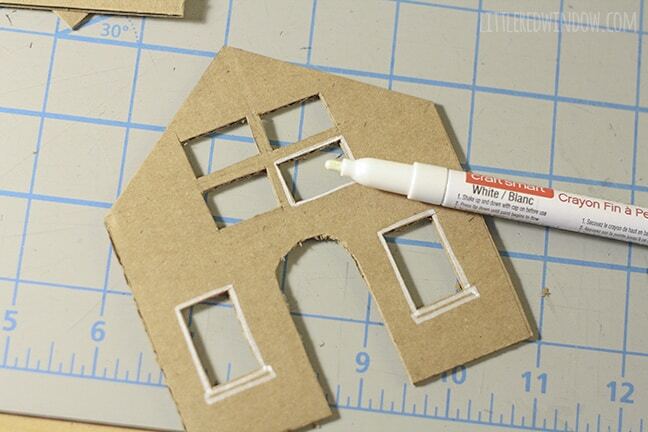 Use glue to attach the sides to the front. Then add the back. These houses do not have a bottom. 6. Now all you need is a roof! 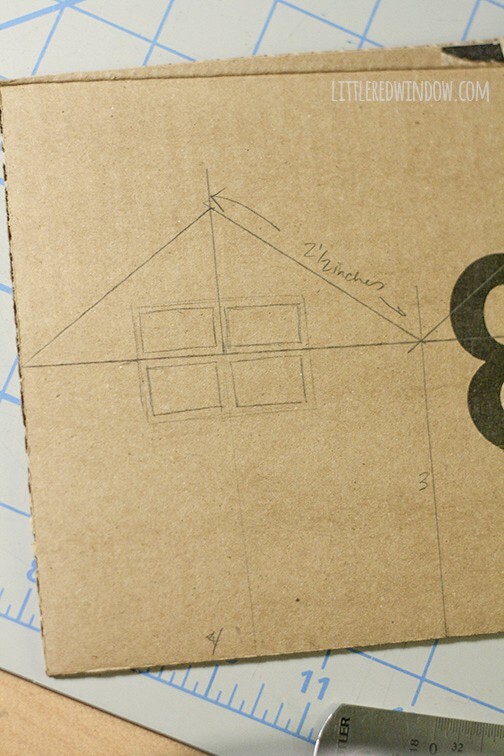 I waited to measure and cut the roof pieces because sometimes, the final product can be not exactly the size you planned due to inconsistencies in cutting or something not having perfectly right angles. o measure for the roof pieces once the body of the house is built. You can have the eaves hang over as much or as little as you want! After this, you’re done! 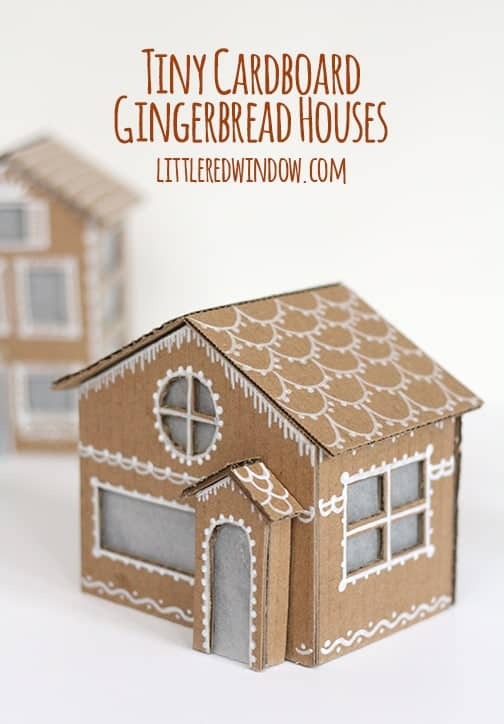 Make these adorable Tiny Gingerbread Houses out of recycled cardboard, they're so easy to make and you can use them year after year! 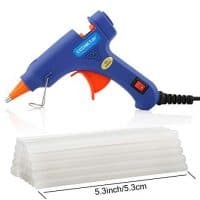 Decorate the roofs with "frosting"
go slowly with your knife, it will take a few passes to cut all the way through. 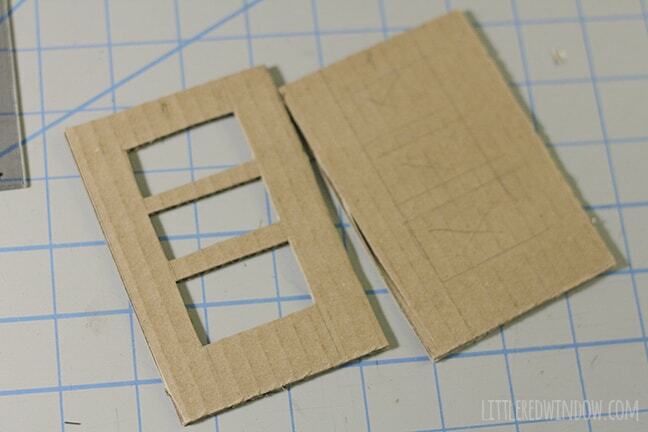 sometimes it helps to turn the piece of cardboard over to the back to see where you haven’t cut through yet. 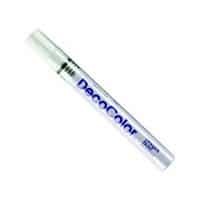 This can be helpful at corners. What an extraordinary undertaking for pre-schoolers. I am sending the thought for the reused gingerbread men to my little girl in law. I extremely like the little house. Super, super adorably cute! 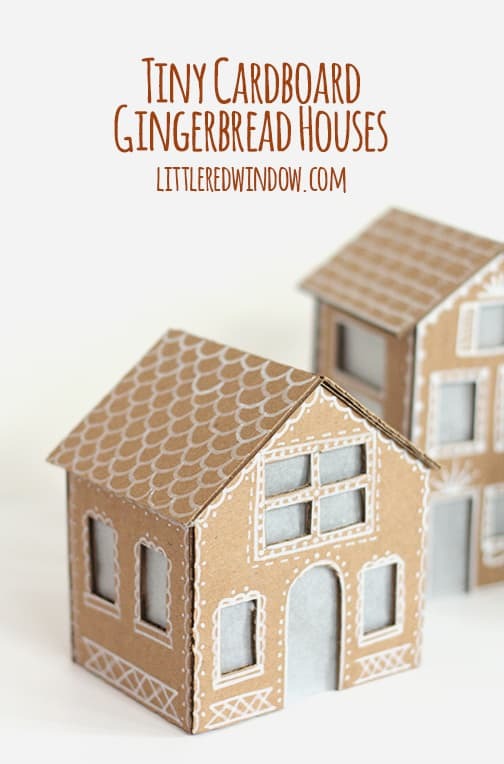 I want 24 of those houses for our advent calendar! 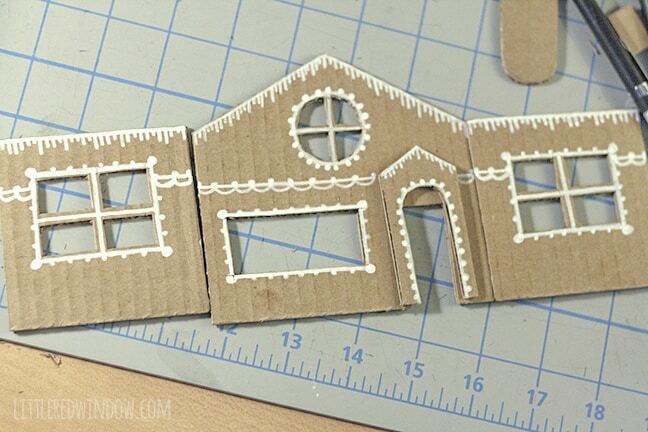 As I don’t have a degree in Cutting and Gluing, fortunately I managed to order some very basic blank cardboard houses online which I will decorate. Yay! These little houses were such a great inspiration. I only had time to make two on Christmas Day before a large dinner party but they were so adorable and I love them! Oh, good! I’m so glad you liked them! Thank you for the feedback, I’ll definitelt talk with my ad provider! I appreciate that you have ads and why, but there are just way too many here. I love your style and posts but I’m on the iPad most of the time and the ads just take over the whole post. I just made one using your guidelines. It turned out super cute! Thanks so much for posting these! These are darling! Pinning them right now!!! Oh my gosh, they’re absolutely adorable! I will definitely try to make some. They’d be great as gifts! These are flipping adorable!!!! Pinning! I am officially in love with these gorgeous little houses. They could not be more cute if they tried! 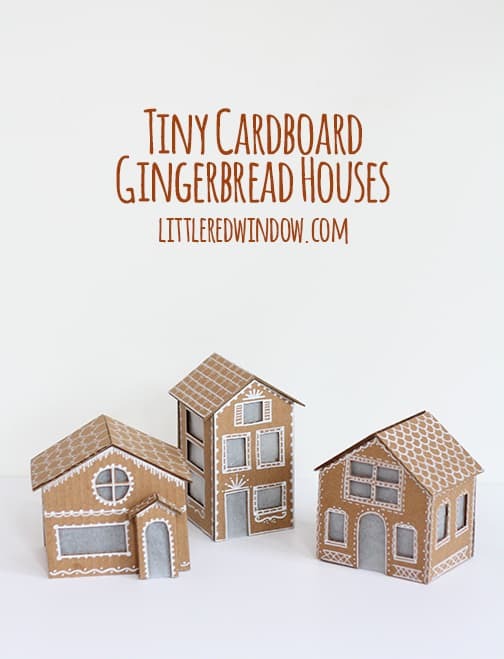 I am obsessed with tiny villages right now and these are the coolest!! 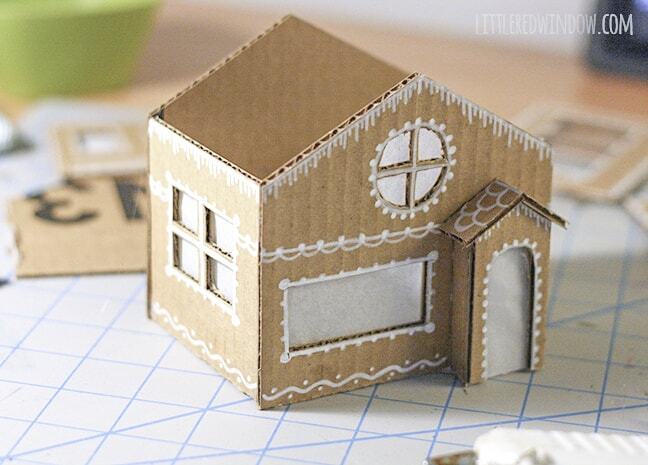 I would’ve NEVER guessed that you could make these adorable houses from cardboard! So clever! They are so adorable. 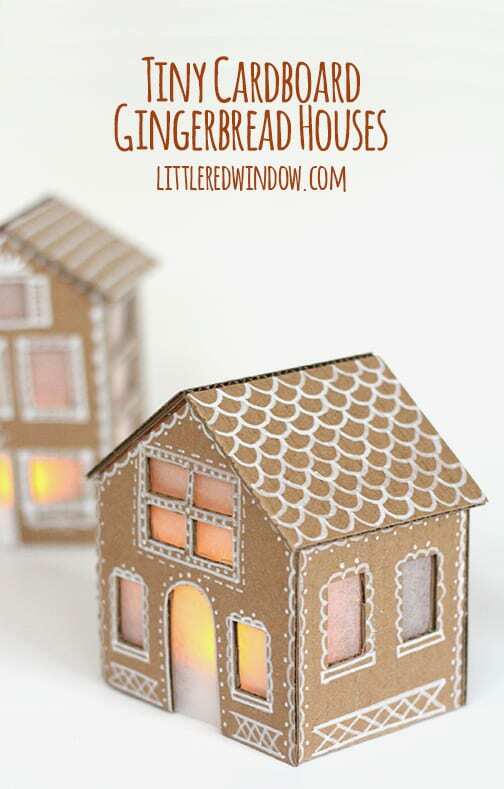 Such a fun holiday craft to do with the older kiddos. I know my girls will love to make these with me. 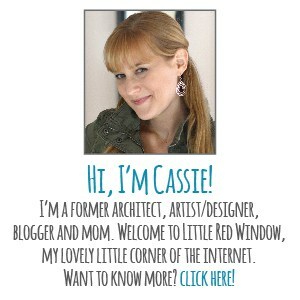 Thank you for linking-up to the Oh My Heartsie Girls Wordless Wednesday. Love these! They look so cute and realistic, without the trouble of making something that you’ll have to throw away. I’m including this in some features on my blog tomorrow at Your Turn to Shine. Thanks so much for sharing with us! Cassie, these are SO ridiculously cute I cannot even stand it. I’m sending this link to my friend who is also a former architect (and who also lives in OP)! 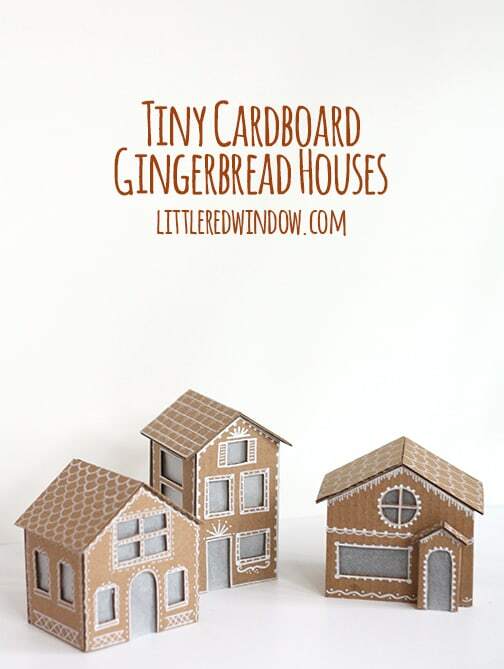 She constructs these amazing real gingerbread houses every Christmas, but this year, I think she should do cardboard! ha! Thanks Bre! I bet her real gingerbread houses are amazing! That requires patience and baking abilities far beyond mine, lol! Ok this is fantastic! I gotta try this! Thank you for inspiring me! Glad I found you today at Sew Can Do link up! Pinning! 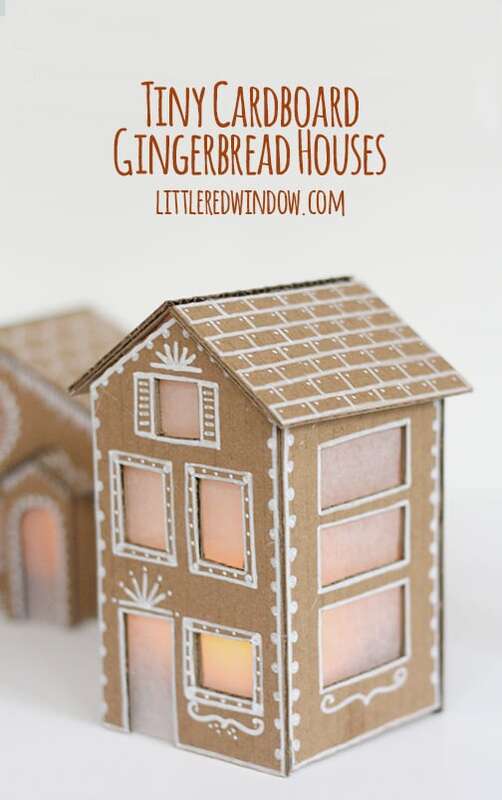 ridiculously adorable, especially with the lights from inside. that paint pen really works well for this. These are too cute! I’ll have to try this with the kiddos and ditch the edible version. Do one each year when they’re young, then by the time their adults they’ll have a whole village! Thanks for the wonderful idea! Ahhhh these are too stinking adorable. I love them. You’re awesome. ohh they look so cute!!! I want to make them too, my daughter would love them! amazing, well done!